Below are two treats I made this weekend. I hope you enjoy them as much as I did. Blitz the biscuits in the food processor until they form coarse crumbs. If you prefer you can put them in a sealed ziploc bag and bash the hell out of them with a rolling pin. Tip into a mixing bowl, add the melted butter and a tablespoon of water, and work in with your fingertips until clumpy. Start by spooning about half the mixture in the center of a loose-bottomed tart dish or tin. Using the back of a large metal spoon and your fingers, press down firmly and evenly. Gradually add more mixture as needed to line the base and sides of the pan. Any leftover mixture can be frozen and crumbled over softened ice cream). Refrigerate the lined pan for at least 1 hour, or overnight if convenient. Whisk together the mascarpone, cream and vanilla, sweeten to your liking with the powdered sugar, and refrigerate until needed. 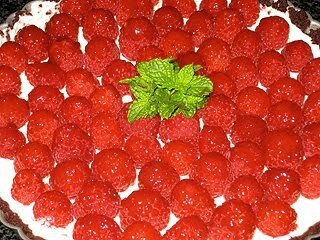 Shortly before serving your meal, spread the mascarpone cream over the chilled tart and return to the refrigerator. Just before serving, lift the tart carefully out of the pan, and place on a serving dish. Heap the raspberries on top, sprinkle with chopped mint leaves and either dust with more icing sugar if you like, OR use a pastry brush (or a crumpled-up paper towel) to coat the fruit with the raspberry glaze. Beat egg yolks with ricotta and vanilla. Add remaining ingredients and mix well. Beat egg whites until stiff. Fold whites into ricotta mixture. Heat griddle until drop of water sizzles. 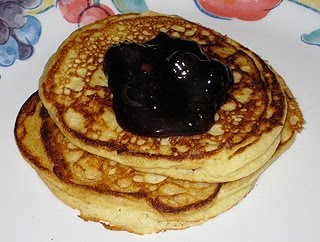 Cook as regular pancakes. In a small bowl, combine the lemon juice and cornstarch, then set aside. In a medium saucepan, combine the blueberries, sugar, water and salt. Bring mixture to a boil over high heat. Reduce to a simmer and stir in lemon juice-cornstarch mixture. Simmer, stirring, until the sauce thickens slightly, about 2 minutes more. Cover and set aside. What a delicious weekend! These look just delicious. I love both mascarpone and ricotta! Moan. Two of my favorite cheeses. In one place. Does life get any better? So the titles alone had me drooling! I love how you used digestive biscuits in the crust. I still miss those! And adding ricotta into your pancake batter is brilliant. Wow, that tart looks fantastic and must taste just as wonderful. And I'd love some of those pancakes for breakfast right now. I'm with Joanne. Two of my favourite cheeses. It doesn't get much better than that. Thanks for dropping by my blog today, nice to meet you! I'll be stopping by often! Serious drooling...the tart is gorgeous! That tart looks absolutely divine! Oh yum! That tart looks great!